U.S. states have introduced bills requiring sugar-sweetened beverages (SSBs) to display health warning labels. This study examined how warning labels influence parents and which labels are most effective. Over 2,000 demographically and educationally diverse parents of children ages 6 to 11 participated in an online survey. 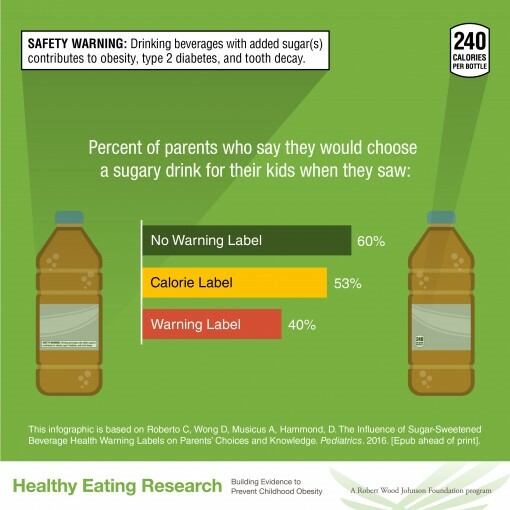 Parents were randomized to one of 6 conditions: 1) No warning label (control); 2) Calorie label; or 3-6) one of four text versions of a warning label (e.g., SAFETY WARNING: Drinking beverages with added sugar(s) contributes to obesity, diabetes, and tooth decay). Parents chose a beverage for their child in a vending machine choice task, rated perceptions of different beverages, and indicated interest in receiving beverage coupons. Significantly fewer parents chose an SSB for their child in the warning label condition (40%) versus the no label (60%) and calorie label conditions (53%). Parents in the warning label condition also chose significantly fewer SSB coupons, believed that SSBs were less healthy for their child, and were less likely to intend to purchase SSBs. There were no consistent differences among different versions of the warning labels.